Sorghum is a grass, relied upon in much of Africa and elsewhere as an annual grain crop. Plant breeders have been working on ways to “perennialize” annual grains including sorghum. Perennial sorghum, then, is sorghum that keeps growing over multiple years. What are some advantages of perennial grain? Greater heat and drought tolerance than annuals. This is due in part to the fact that perennials generally have more extensive and efficient root systems than annuals. Reduced soil loss, through continuous cropping of the land. Better use of fertilizers, as a result of greater recovery of applied nutrients in comparison to annual crops. Labor savings, as the grain crop would not need to be replanted each year. Increased biomass in comparison to annuals. This has implications for keeping soils covered. 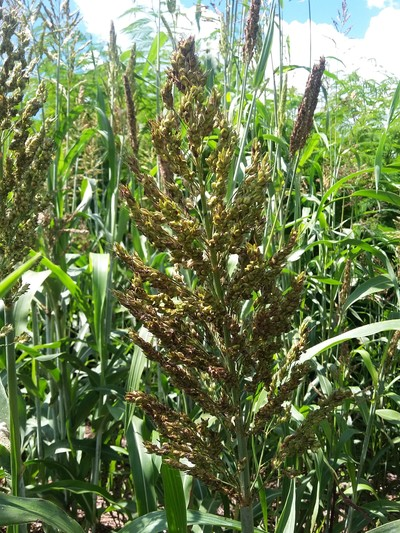 How is annual sorghum changed to perennial sorghum? 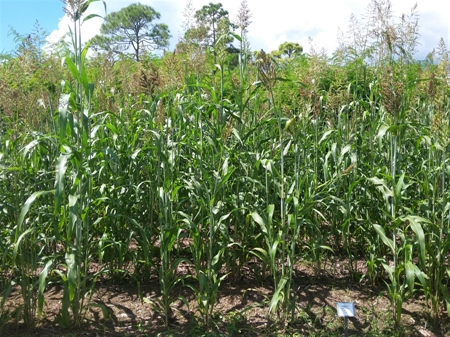 The approach taken by the Land Institute is to cross Sorghum bicolor (annual, domesticated sorghum) with Sorghum halepense (johnsongrass, a wild perennial/weedy sorghum relative). How did ECHO’s test plot get started, and what is the goal? The Land Institute graciously supplied ECHO with a small quantity of seeds to test. The seeds we were given are a population, with a wide diversity of traits. Our objective is primarily to grow out a population of plants and select for those that turn out to be perennial under our sub-tropical conditions. The seeds were direct seeded into the field on 7 July 2016. Below is a photo of what the plants look like as of the end of September 2016. Over time, we will remove plants that are stunted or that do not produce thick grain stalks. So far the plants have grown well, tolerating high rainfall and heat. The plants are producing grain heads now, with an abundance of tillers. Even the weakest plants we’ve pulled up have been firmly rooted. We anticipate being able to provide updates on our progress in the future.